We are delving into the story (in eight weekly episodes) of Anthony Rosenbaum’s chess group-portrait. He started it in 1874 with just 18 sitters, then abandoned the project and, what with illness and other distractions, could only resume a few years later, then raising his game to squeeze in a dizzying 50 or so characters. He signed it off "A Rosenbaum 1880" in the bottom left-hand corner. There's a lot to discuss, and for this episode we'll stick to the subject matter of the painting. 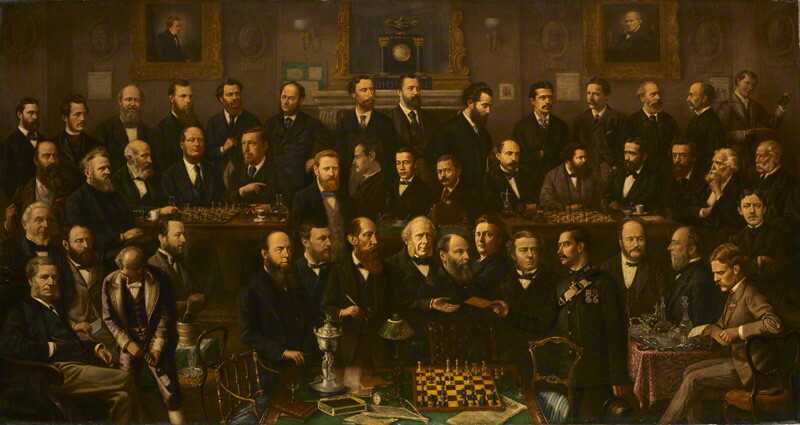 At its unveiling in 1880, before an invited audience from the London chess world, the following caption was provided, according to the The Chess-Monthly: “A match by telegraph, suggestion for the future”. 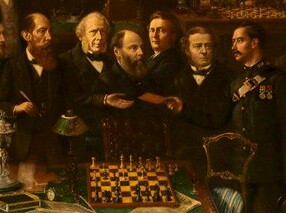 This, surely, must have been appended with the artist’s approval, suggesting that it might serve as the painting’s official title – and suitably uplifting that would be too, in keeping with the spirit of that burgeoning scientific and entrepreneurial age; something that is missing, one feels, from the rather pedestrian, if literal, “Chess Players”, as it is so-named by the National Portrait Gallery. "The scene represented is an ideal match by telegraph, London playing against three cities in different parts of the globe. The moment chosen is the arrival of the message containing the move, which is handed by the commissioner to the hon. sec. of the Universal Chess Club." And indeed you can see the liveried footman in the foreground (fourth from right) passing the chit to the outstretched left hand of the red-bearded chef de parti, across a phalanx of four other gents. Here the The Chess-Monthly's commentator has enthusiastically entered into the spirit of the occasion and allowed himself a flight of fancy: there appears to have been no such outfit as the “Universal Chess Club,” at least I have been unable to find a mention of it in Sergeant, for example, or even elsewhere in The Chess-Monthly which was assiduous in reporting the chess goings-on of the time. If then it was, as it appears, a conceit, perhaps it was at Rosenbaum's instigation: it wasn’t just play by telegraph he was envisaging, but one big world-wide-web of chess players, all joined in universal association. It was his utopian vision of the chess future, and all the more pertinent given the then "unfortunate state of disunion in metropolitan Chess circles" as The Chess-Monthly put it. We'll come back to that as Rosenbaum himself wasn't merely an innocent bystander in the messy business alluded to. But: "unfortunate state of disunion in...Chess circles" - that's more unwittingly prescient than they could ever have imagined. Do they mean us? The “match by telegraph” tag encourages the speculation that Rosenbaum’s inspiration for the mis en scène, way back in 1874 when he first started his project, might have been the telegraph match between London and Vienna that had concluded in the March of that year. But even if so, he was not, as his composition developed, depicting that contest slavishly: they played only two games (London 1.5 – 0.5 Vienna), not three as shown. "The first game, commencing from the left of the spectator, is conducted by Messrs. Macdonnell, Lowenthal, Bird, Blackburne, and Mason, attended by Messrs. Clarke, Thomson, Walrond, Gastineau, Pearson, Kunwald, and Rabbeth;"
"the second, on the right, by Messrs. Hoffer, Steinitz, Zukertort, Potter, Horwitz, surrounded by Messrs. Gümpel, Coburn, Ballard, jun., Mackern, Rosenbaum, and Murton;"
"the third game, in the centre foreground, is played by the Rev. W. Wayte, Lord Dartrey, Messrs. Minchin, Salter, and Wyvil. The rest is filled in by Messrs. Eccles, Wagner, Vyse, Lord, Walker, Chapman, Hirschfield, Tinsley, Cubison, Woodgate, Greenhough, Day, Studd, Ballard sen., and Donnisthorpe." As you can see, Rosenbaum has clustered the chess heavyweights (e.g. Bird, Blackburne, Steinitz, Zuckertort) around games one and two, in the second row. Grouped around game three in the foreground are various officer-bearers and VIPs from St. George's Chess Club, one of the two principal London chess clubs of the day, the other being the City of London CC members of which are also dotted around, as are various chess movers and shakers (from both clubs) who frequently crop up in the accounts of the period. Making up the numbers are lesser lights, who were stalwarts of the chess scene nonetheless. This series of posts can't investigate in detail all of these characters, and anyway the strongest chess-wise have been generously treated elsewhere, for example in Tim Harding's latest book Eminent Victorian Chess Players. We will, though, in later episodes, stop and have a close look at one or two of the others who particularly catch the eye, and we'll comment briefly on some others in passing. "[Mr Murton is] to me...a seemingly very ordinary mortal [who] may seem to be a hero...not eminent in chess, but by his integrity, his straightforwardness of character, his unselfish love of chess throughout a long series of years, he has gained the esteem, the admiration, and even the affection of his brother-members..."
Prettily put; and so say all of us. "The attitude of most of the gentlemen mentioned expresses curious expectation of the telegram just arrived and to be opened by Mr. Minchin. Mr. Day especially seems to look very attentively for the move, whereas Messrs. Cubison, Greenhough, and Studd express by their quiet demeanour confidence in their ultimate victory. Mr Donnisthorpe is pretending to read the score, but we think, with due respect he is looking at the gorgeous silver tray in front of him, embarrassed which of the splendid crystal decanters to choose. Mr Hirschfield has evidently been reading the CHESS-MONTHLY, which he is putting down temporarily in order to attend to the game." And here we can make our own bit of mischief : Wordsworth Donisthorpe (1847-1914) (he himself used only one 'n') - a wonderfully exotic figure, he's in the front row, extreme right - is, more likely, musing over his latest libertarian tract denouncing the State and all its Works; and Mr Hirschfield (1840-1896) - black-bearded and business-like, front tier, far left - has been admiring the dividend at his own start-up: the Kœnigsburg Tea Company. Indeed most of the gents would, don't you think, have been keeping more than half an eye on the serious business of their professional, commercial, clerical, and even political, interests while they applied the lesser part to the conduct of the game at hand. We can also detect in that little foreground vignette, where the note is handed across, some infelicity in the posing of the figures that betrays the incremental, not to say accidental, accumulation of portraits in the painting. We can't overlook that the commissionaire impolitely ignores several gents one of whom, by Jove, is an Earl - he's the shortish cove in the middle - in order to offer the move to the untitled Mr Minchin, the occasion's Master of Ceremonies. Lord Cremorne, by then elevated as The Earl of Dartrey, must decidedly have expected to enjoy the benefit of precedence and to be the first to accept the note; indeed he is positioned as if he might have been ready to claim his privilege, but is then passed over somewhat discourteously. Adjacent to the footman Mr Wyvill casts the poor chap a dirty look, and Mr Woodgate, next along, double takes at the impertinence. The explanation for this lapse in etiquette might be that Rosenbaum had to wedge in his portraits as each subject came to hand. The Earl may have been dropped into the painting centre-stage front as befits his status, but the action proceeds as if without him. Frankly, he might just as well not be there. In the next episode we will have a look at some characters who, in fact, really aren't. For a little chess, and to finish off, let's go back to the London - Vienna match of 1872-4, interrupted and prolonged by a play-stopped-play break caused by the main players trooping off to the 1873 tournament in Vienna (by coincidence), occasioning one of the longest adjournments in chess history. Here is London's victory, gained after opening with a grateful nation's favourite move: 1. c4. More in a week's time. *The labelling of the individuals in the painting is based on the key in the NPG Archive, which I have assumed to be contemporaneous with the painting. This facsimile key was reproduced in Chess in 1993, and will appear in a later episode. The coquettish Wordsworth Donisthorpe has attracted his fair share of interest in recent years (of that he would, no doubt, have been well pleased). The most recent example is here. We will gaze upon him, in all his pomp, in a later post. For a full account of the London - Vienna match and games, with comprehensive annotations ancient and modern, see Tim Harding's articles here and here. Sergeant, P. W. A Century of Chess History (1934). Access all episodes of this series (forward and back) via the History Index. Gosh, they really didn't play very well in those days, did they? Still, at least London didn't fall for 6 Nc7+? Qxc7, and who says Shirov/Chebanenko invented 3....Be7?! I could easily pick out several of the more famous personages: Blackburne, Mason, Steinitz, Zukertorte, Bird, MacDonnell and Horwitz. I'd never seen Loewenthal with a full beard before nor Hoffer with that little beard in the middle of his chin! I thought Cubison was Skipworth and Donisthorpe, several of whose pictures I'm seen, reminds me here of William Penn Shipley of Philadelphia. I'd never seen pictures of Wyvill, Tinsley, Waytte, Minchin or Potter before. And I'm guessing "Gumpel" is Charles Godfrey Gumpel of Mephisto fame. I wonder if the "Day" pictured is somehow related to Mary Link Leeming's second husband, George Day. Yes, Sarah, it's quite a historic document - a record of what so many of these chessers may have looked like. link here). Thanks for the notion! More shocking games to follow, John.